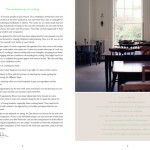 Click the images above to see sample pages of the Gaia House Cookbook. Click the black background to return here. Order your copy below. 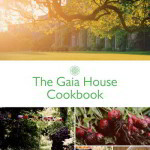 The Gaia House Cookbook is a long-awaited collection of recipes reflecting the range of nutritious and delicious meals provided daily at Gaia House by our dedicated cooks and those offering voluntary service to the house. 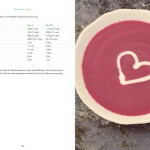 Brought into being largely through the committed efforts of volunteers and ex-coordinators, the book includes recipes for soups, main dishes, sides, salads, dressings, desserts and a meditative introduction by Martine Batchelor. 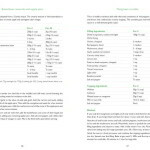 The ingredient quantities are set out for four and 40 to enable both home cooking and cooking for larger numbers in centres. All profits from the cookbook will be donated to the Financial Assistance and Bursaries Fund to help ensure that Dharma teachings can continue to be made available to all who wish to participate in our programme, irrespective of financial circumstance. To order the cookbook online please click your delivery destination below. This will open a Paypal Shopping Cart in a new browser window. If you require more than one copy of the book, please type in the quantity you require and press ‘Update’. You will have the option to pay either with your Paypal account or with your debit/credit card. Please note that you can only select one delivery address per transaction. Orders will be dispatched within 14 days. If sending a cheque, please include a note confirming your contact details, the delivery address and how many copies of the cookbook you would like.